Baseline: Pre SOP, Box breathing, ROM Drills. Then 3 rounds – 50x double unders, 25x air squats, 15x push up, 5x pull up. Durability: Row 5k meters then Grinder PT with core focus for 15 to 45 minutes. Warrior Yoga drills and Post SOP recovery. 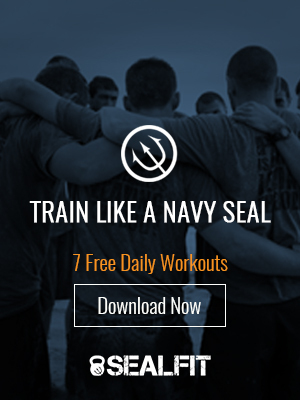 Check out the new Way of the SEAL Leadership Development Course by Coach Divine. This program is a leadership application of the powerful Unbeatable Mind Foundation Course.